The eye of Hurricane Igor takes center stage in this photo by NASA astronaut Doug Wheelock from the International Space Station on Sept. 14, 2010. 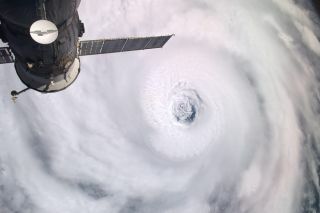 Hurricane Igor dazzled the crew aboard the InternationalSpace Station and even earned a nickname after the astronauts gazed straightthrough the huge storm's eye to see the ocean waters below. In an interview televised on NASA TV that same day,Wheelock said: "We looked right into the eye of HurricaneIgor,which is absolutely fantastic, the view. We could see the water of the AtlanticOcean right down through the eye, and it was spectacular. It really just takesyour breath away ? no words to describe it." Wheelock also snapped a photo of the Atlantic storm thatwould become HurricaneJulia. ?? Astronaut Shannon Walker agreed with Wheelock'sdescription. "The hurricanes are spectacular," she said. NASA released a videoof Hurricane Igor from space, recorded by cameras on thestation Tuesday. As of today (Sept. 15), Igor had weakened slightly,though it remained a Category 4 hurricane on the Safir-Simpson scale, accordingto the National Hurricane Center. The strongest storms are labeled Category 5. Wheelock photographed Julia as it left the Cape VerdeIslands, before it produced the wind speeds fast enough and barometric pressurelow enough to gain hurricane status. In his Twitter post, Wheelock said heexpected Julia to grow stronger. "Currently only a tropical storm, but showingtremendous organization and rotation," Wheelock wrote. "I think wemay hear more from Julia in the coming days." Currently it is a Category 4hurricane like Igor. Space station astronauts have been keeping a close watchon the 2010 hurricane season, which runs from June through November. Stormscientists are also tracking another potential hurricane, Tropical Storm Karl,as it makes landfall on Mexico's Yucat?n Peninsula. Coming back out over theGulf of Mexico, it could strengthen into a hurricane before making landfallagain along the coast of Mexico.? The space station is currently home to six astronauts:three Americans and three Russians. WhyAre Category 5 Hurricanes So Rare?